As these 2 cops find 5 kids, they don’t hesitate. The entire internet is celebrating these heroes! Home » Health » As these 2 cops find 5 kids, they don’t hesitate. The entire internet is celebrating these heroes! In the last week, some colleagues were called to a situation in Woensel-Nord. There, an ambulance had just picked up a woman, who had drastically low blood-sugar levels. The woman gained control again in the ambulance, but her 5 small children were still in the apartment. Since our colleagues had to wait for the children to be taken into custody of some relatives, and the kids hadn't eaten, the police offices got to work in front of the stove. The children received bread and fried eggs and fruit on the side. Then they had to wash up, of course!" 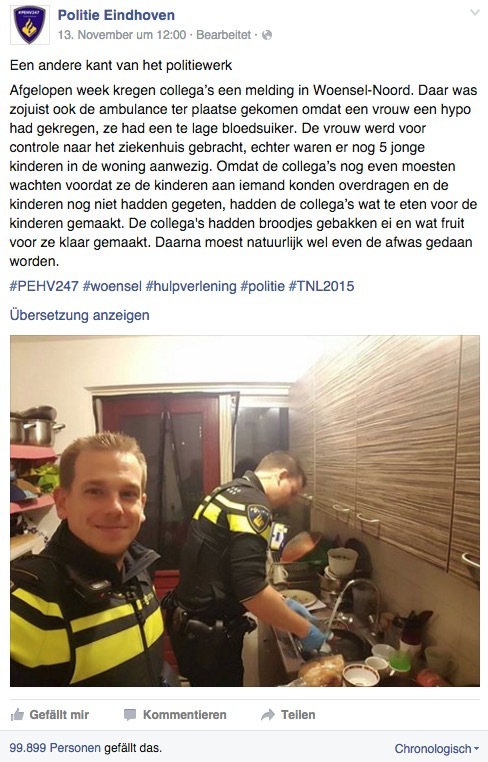 These police officers have seen that in an emergency one shouldn't hesitate - even when helping means washing up in uniform. That's clearly an official duty! Almost 100,000 people on Facebook have "liked" this post and it's been shared thousands of times. If this side of police work, which isn't normally seen, also impressed you, then share this adorable photo with everyone that you know.